We’ve got a special treat froyo today: a new food holiday to celebrate! June 4th is National Frozen Yogurt Day. It’s also National Cheese Day, and that’s what we chose to celebrate last year. Tara’s mac ‘n cheese is bomb-diggety! It’s also National Cognac Day, which means in 2015 we may be celebrating yet another food holiday on June 4. Incidentally, some sources list Frozen Yogurt Day as February 6, but that makes about as much sense as celebrating cotton candy in December! People have been enjoying yogurt (sometimes spelled yoghurt, though that just yoghurts my eyes) for thousands of years, mostly in the Middle East and India. To make yogurt, milk is fermented by bacteria known as yogurt cultures. These cultures turn lactose into lactic acid, which gives yogurt its distinctive texture and – like Hank Williams – tang. No, wait. That’s twang. My bad. Yogurt was introduced to the U.S. in the early 1900s, and quickly gained popularity as a health food. Even though there seems to be a TCBY or Menchie’s on every street corner now, frozen yogurt wasn’t actually created until the 1970s. It failed spectacularly at first; people were put off by the sharp taste, much preferring the sweet flavor of ice cream. TCBY came along in 1981 with a sweeter version, and sales took off. People loved eating “fro-yo” while rocking out to Wang Chung! Especially when they could add their own toppings (which included items like M&Ms, granola, and fruit). But the American public, being fickle, decided once again that you just couldn’t beat high-fat ice cream, and frozen yogurt sales dropped off in the 90s. As did Wang Chung record sales. A possible correlation? By the mid-2000s tastes had changed again, and suddenly the too-tart frozen yogurt that was shunned in the 70s became all the rage. Sales in 2013 were higher than ever. Visiting a frozen yogurt shop in the 80s was a rite of passage every bit as popular as grabbing a VHS movie from the video store. 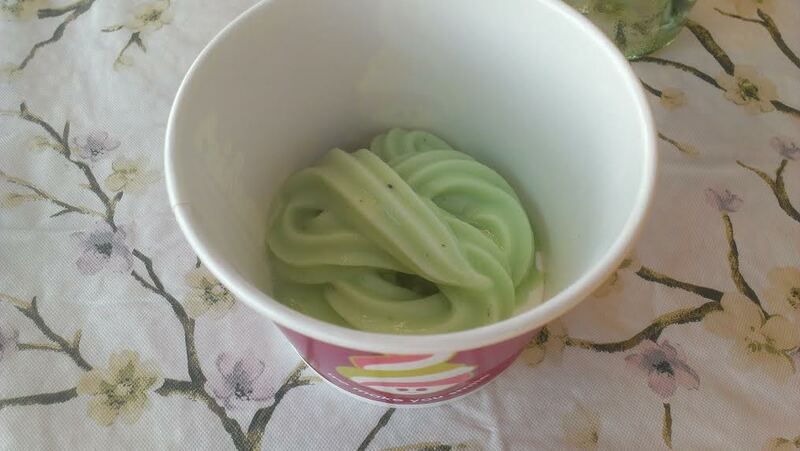 However, much like the latter pursuit, I hadn’t been to a frozen yogurt place in years. That streak remains intact, but Tara stopped by the local Menchie’s and picked us up small cups of vanilla, chocolate, and pistachio to share. I’m an old-fashioned guy and liked the vanilla best, while Tara preferred the chocolate. In fact, it was so enjoyable, we just might have to add frozen yogurt back into our routines as an occasional treat.